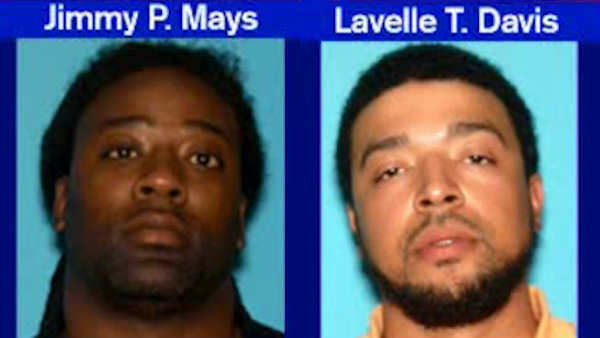 MAPLEWOOD, New Jersey (WABC) -- Police have arrested two suspects in connection with a triple homicide in New Jersey. Jimmy Mays, 37, formerly of Egg Harbor Township, was arrested in Maryland and charged with murder in the deaths of 45-year-old convenience store owner Michael Davis, 30-year-old Roshana Kenilson and 44-year-old Lance Frazier on Van Nest Court in Maplewood in late January. Prosecutors also announced that 33-year-old Lavelle Davis, of Galloway, was arrested in Yonkers early Saturday morning. He was identified as a suspect Friday, and was considered armed and dangerous. Mays is awaiting extradition to New Jersey. Both have been charged with three counts of murder, as well as conspiracy to commit murder, felony murder, robbery and weapons charges. Anyone with information about the case is asked to call 1-877-TIPS-4EC or 1-877-847-7432.